Scott Miller’s final semester at Iowa State University (ISU) is all planned when it comes to course schedules. But the construction engineering senior knows that some lessons lie outside the classroom. “All the professors I’ve had, they’ve always emphasized it’s about who you know,” Miller said. The Civil, Construction and Environmental Engineering (CCEE) student is a member of Iowa State University’s Mechanical Contractors Association (ISU MCA) and has been for the past three years. Last month, ISU MCA received news that the Mechanical Contractors Association of America (MCAA) Career Development Committee had awarded the group a 2016 Chapter of Excellence Grant. As the ISU organization’s president, Miller knows the importance of the recent award. He has had the chance to network with MCA contractor members at career fairs, through industry nights and at socials. Those are all reasons he first joined the organization. “It’s all about networking, and MCA provided all kinds of opportunities for me to network,” Miller said. Brad Perkins is a senior lecturer in ISU’s CCEE Department. He also advises ISU MCA members and says it takes a focused engineer to be a part of the organization. “The ones in MCA are more narrowly focused in their degree plan and probably what they’re going to do when they leave here,” Perkins said of ISU MCA members. 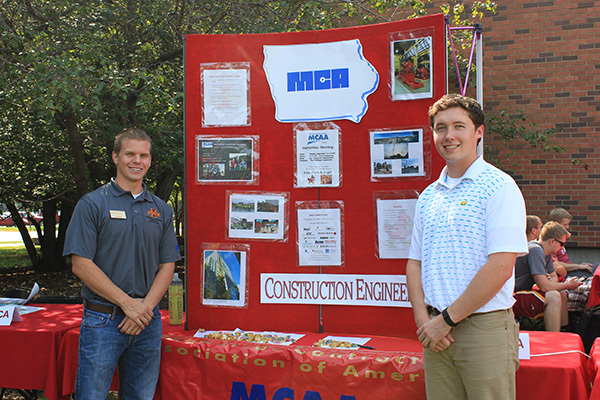 He explained that ISU MCA was awarded $5,000 from the MCAA Career Development Committee. Perkins says that money will be used to support academic scholarships for students within the organization. for this year to provide amazing opportunities for those students that are interested in the mechanical side of construction,” Miller said. To learn more about ISU MCA and other student organizations, visit the ISU CCEE “Student Organizations” tab online. And connect with ISU CCEE via Facebook, Twitter, and LinkedIn.